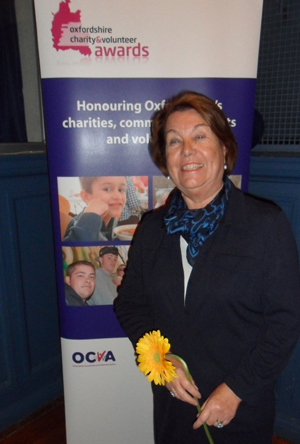 Joyce Burrows who lives in Nicholas Road and has been a volunteer at Sue Ryder Nettlebed Hospice for over 20 years has been awarded a much deserved honour at the OCVA Making a Difference Awards held on 14 October in Oxford Town Hall. Joyce was one of 40 individual award winners across the County presented by Graham Upton, High Sheriff of Oxfordshire. The Nettlebed sale of goods donated by the public is well known in Oxfordshire and attended by up to 1,500 people on a Saturday, and is held every 3 weeks. There are 23 departments selling items such as furniture, DIY, garden products, clothes, toys, books, china, bric a brac, shoes, pictures, paintings, curtains, music etc. The sales are held in the grounds of the Hospice and all of the volunteers are passionate about helping to raise funds to support the charity’s annual voluntary income need of over £2million to continue to provide its local care. The sales were started over 30 years ago by a very small team of volunteers who wished to raise funds to support Sue Ryder and the Nettlebed Hospice which provides specialist palliative care for people suffering with life-challenging illnesses and their families. Joyce Burrows joined the fast growing team of volunteers in 1993, and, as the sales grew she willingly became the Volunteer Co-ordinator. Sales volunteers now number 350, and Joyce co-ordinates all of the teams of volunteers who receive and sort donations from the public, and who make the sale such a success! The Nettlebed sales raise large amounts of funds and Joyce is a vital member of this fundraising team, and will drive to the Hospice, come rain or shine to co-ordinate the volunteers who sometimes have to be asked to stop sorting donations, when the weather is bad, as they may become snowed in at the Hospice! This is just one example of how loyal the volunteers are. Joyce knows every one of the volunteers by name, and will respond quickly when one of them is unable to volunteer, and endeavour to arrange for someone to help out. Joyce also inspires and encourages all the volunteers who are so committed in their desire to fundraise. She is an ambassador for Sue Ryder, and her contribution is highly valued. Joyce is always able to share her views, suggestions and ideas, and is an important member of the fundraising team. Marion Haynes, Fundraising and Sales Volunteer Co-ordinator said, “I am proud to know Joyce and have her skills and enthusiasm available to the team and I am delighted that her tireless work has been recognised by the OCVA award. It was lovely to accompany Joyce and her husband Bill Burrows to the Awards”. Well done Joyce and we are so fortunate to have Sue Ryder on our doorstep.